Thanks to reader Linh and Jason Gibbs, we know know that this is a piece featuring the famed Phước Cương troupe. They are performing an example of cải lương, a “classical” type of Vietnamese theater music played on traditional instruments, and it is an excerpt of a piece known in English as “Sentencing the Precious Consort Pang.” The record dates from the mid- to late 20s. According to Linh’s description, cải lương sets lyrics over older, classical Vietnamese songs. The songs that are played in this excerpt are Khoc huang thien, Ngu Diem, and Thien Tuong. Beka was sold to Columbia in 1926, although the Beka imprint seemed to last well into the 1930s. The company made at least 140 recordings in Vietnam, and had a considerable presence in Asia throughout the early part of the century, having begun to record there since ca. 1906, when they first landed in Hong Kong. The singers are accompanied by a bamboo flute (either the sao, or the tieu), a bowed instrument (probably a dan gao or dan nhi), and a plucked lute of some kind. I love the tinny quality of the track – so odd to hear cartoon jazz quality sounds out of cai luong recordings. Anyway, this is an excerpt from a cai luong play as you already surmised. Cai Luong’s modus operandi is to set lyrics over songs from the classical chamber music repertoire of Vietnam. Khoc hoang thien, Ngu Diem, and Thien Tuong are names of the classical songs that underly this selection. The title of the play is Su An Dan Qui Phi; I think Dien Khi and Phuoc Cuong are the actress and actor’s name. The excerpt itself isn’t titled. Thanks again, and feel free to contact me via email next time you’re preparing a post on Vietnamese music. Phước Cương was the premier cải lương troupe of the time. 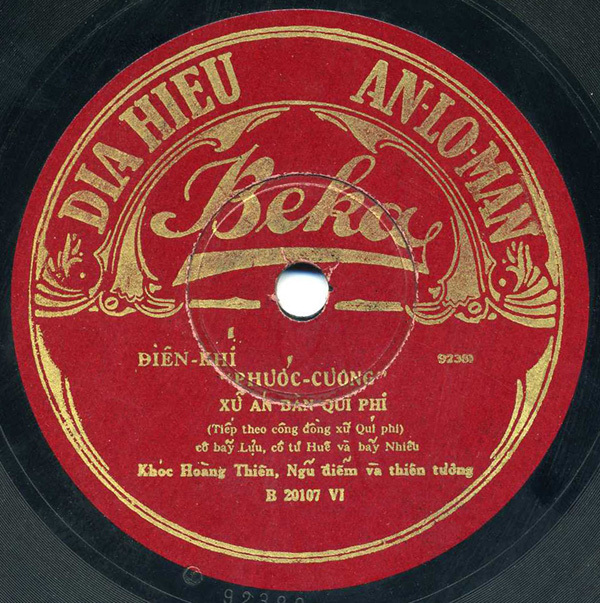 This side was part of a 4 record set condensing the larger cải lương play “Xử án Bàng Quí Phi” – Sentencing the Precious Consort Pang from one of the the Judge Bao stories from Chinese folklore. It’s a treat to finally hear Bẩy Nhiêu sing. He was a real innovator of the cải lương stage. Thanks so much for illuminating this very early post, which desperately needed it! I will amend the post and credit you. Much appreciated. If you have any more Vietnamese music in our collection, I’d love to hear it.